Bass Pale Ale is one of the most recognizable English beers on the planet and the principle product of the Bass & Co. Brewery. Bass was established way back in 1777 by William Bass in the now famed brewing town of Burton upon Trent. In a world where many beer companies are younger than my bulldog, a brand that has endured for well over 200 years is impressive. Of course, the brewery and beer are now owned by conglomerate brewing concerns, but let's not dwell on that too much. 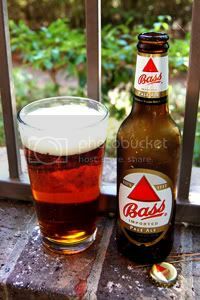 As for Bass Pale Ale itself, it is essentially the typical English Pale Ale, serving as one of the best examples of the style for many people. As the beer was originally brewed in Burton upon Trent, the beer has the characteristic minerals of the area's water. It's also well known as one half of the classic Black & Tan beer cocktail. It's about time I got around to reviewing this English classic, so let's get to it. Appearance: A crystal-clear, copper-amber body topped by a finger and a half of creamy off-white head that features only passable retention and lacing. Aroma: Lightly-toasted malt, some mild earthy hops, and a few notes of banana. Taste: True to the aroma. A base of lightly toasted caramel malt accompanied by mild, earthy hops and some decent fruity notes. It's nicely mineraly, giving it that classic English Pale Ale feel. The aftertaste is lightly grainy and rather short-lived. Mouthfeel: Medium-light bodied with sharp carbonation. Dries a little in the finish. Drinkability: It may not come as much of a surprise, but Bass is a highly sessionable beer. Quite refreshing. Verdict: Bass is simply a straightforward and sessionable British classic, and it's obvious why it has endured for so long. While it may not offer the serious beer enthusiast too much to ponder, it's still a satisfying and refreshing experience that really typifies the English Pale Ale style.